...or How to 'Have Your Cheesecake and Eat it Too'! In case you thought that the Raw Food Diet is about sacrifice and austere deprivation, I have some great news for you: it is anything but! You can make all sorts of incredibly tasty raw gourmet dishes, but desserts are 'creating in the raw' in its most stunning and delectable form. (If you still have your doubts, just take a peek at my post about Fairygirl here. That should take care of it!) What's more, raw desserts have all the scrumptious looks and palatable taste of the most exquisite cooked desserts... minus the undesirable side effects. Guilt-free decadence? Mmmmmmmm... Now you're talking! I must have had SAD cheesecake only twice in my entire life. (I'm not kidding!) All that sugar and cheese... No thanks! What can I say? I was never a big fan of desserts. (I mean, prior to getting into Raw... lol) Therefore, I was initially a little suspicious of raw cheesecake. I kept procrastinating and procrastinating until I could no longer ignore all the hoots and raves about it. Imagine my surprise (and delight!) when I discovered that while raw cheesecake is sweet, creamy and rich, the resemblance with its infamous twin stops here. It is a perfect example of how the 'living' version of a recipe can surpass the SAD one in every way. 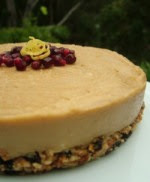 As Cherie Soria, founder of Living Light Culinary Arts Institute, would say: "If you can make a raw vegan cheesecake better than regular cheesecake, why would you eat regular cheesecake?" Process until crumbly but not too much, as you don't want it to turn into a paste. Then press the crust mixture into the bottom of a spring form pan. If you don't have one, no problemo! 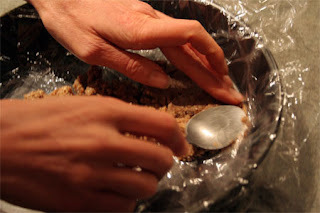 You can use a margarine tub or cake pan lined with saran wrap. A'right, now we'll set the crust aside for a moment and get to work on the filling. Again, if you look at several cheesecake recipes, you'll notice how the filling ingredients are basically the same. One slight variation that you may encounter is in regards to coconut oil. Coconut oil stays firm at room temperature, therefore helping the cheesecake hold its shape once out of the fridge. You may also notice recipes calling for cacao butter. Besides lending its chocolate flavor, cacao butter also acts as a firming agent. Here are the ingredients that we used for this particular recipe: soaked cashews, agave syrup, lemon juice, vanilla and water. We actually forgot to put coconut oil in and, as a result, the finished cheesecake turned out a little on the soft side. Pour filling over the crust mixture and put in the freezer for a few hours to set. Once the cheesecake has firmed up, you can take it out and gently transfer it onto a serving plate. Leave in the fridge to thaw. 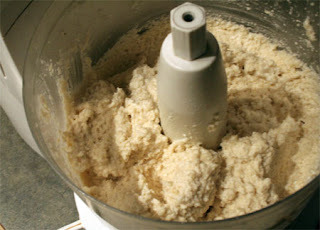 Process the ingredients in a food processor until they are crumbly and will hold together. 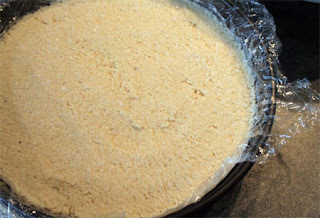 Press the crust mixture into the bottom of a spring form pan* and set aside. * If you don't have a spring form pan, you can use one of those margarine tubs and line it with saran wrap. Blend everything in a high power blender or food processor until smooth. If using a FP, stop to let it rest a few minutes so as not to stress the motor. Pour filling into the crust and let set in the freezer. Once the cheesecake has firmed up, take out and gently transfer it onto a serving plate. Leave in the fridge to thaw. 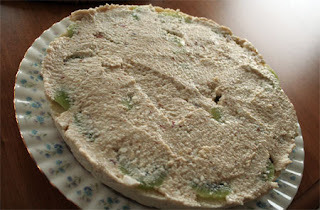 Cover with slices of kiwi and a nice thick layer of Coconut Whipped Cream. 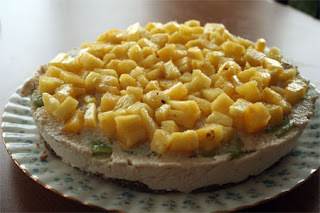 Decorate with pieces of fresh pineapple. Served the cheesecake drizzled with Strawberry Sauce. 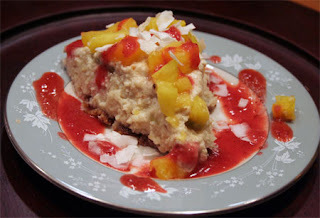 There's a bunch of mouth-watering cheesecake recipes on the Raw Food Talk Forum, but a modified version of Emily Lee Angell's 'Just Like Cheesecake' is probably one of the most 'famous'. 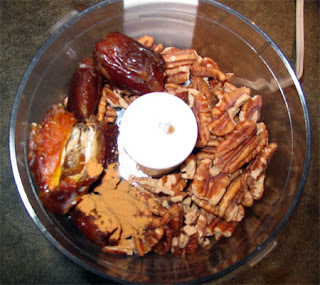 To make the crust, process the macadamia nuts and dates in the food processor. Sprinkle dried coconut onto the bottom of an 8 or 9 inch spring form pan. Press crust onto the coconut. This will prevent it from sticking. To make the cheese, blend the cashews, lemon, honey, gently warmed coconut oil (do not use microwave), vanilla, sea salt (if using), and 1/2 cup water. Blend until smooth and adjust to taste. Place in the freezer until firm. Remove the whole cake from the pan while frozen and place on a serving platter. Defrost in the refrigerator. I forgot to add the vanilla, but mine still tastes amazing! And instead of honey, I used agave and dates. Oh, and another tip. BLEND, BLEND, BLEND all the cheese mixture so it is very creamy and there aren't big chunks of cashews left. Probably an obvious thing to say, but hey! While working on this post, I made Sheryl Duruz's Chocolate Caramel Divine Cheesecake from the gorgeous Raw Food Holiday Celebration Guide. (Well, ya know, I had to know what I was talking about!) Sheryl also posted the recipe on Raw Food Talk. You can find it here. As you'll see, her cheesecake filling is essentially identical to the one above, except that she calls for a little cacao butter and some agave instead of honey. As I didn't have cacao butter, I simply replaced it with coconut oil. I also used less agave, perhaps only 1/2 cup. Although it was quite good, if I was to make it again, I'd put a little less coconut oil and lemon juice, and reduce the salt to a pinch. But hey, everyone's taste buds are different. To demonstrate this point, my neighbor (to whom I had sent a couple of pieces), walked in my kitchen this afternoon, praising how "excellent" and "unreal" the cheesecake was! She still can't get over the fact that it was all raw! Staying with the chocolate theme, raw chef Vanessa Sherwood, featured on GreenChefs, posted the recipe to her decadent Blackforest Chocolate Cheesecake on Raw Food Talk. (The place is a real treasure chest, I tell ya!) Man, if that doesn't look like raw dessert at its best, I don't know what does! (It's on top of my 'to-make' list!) On GreenChefs, it is described as "bursting with sweet cherries layered between a chocolate crust and a creamy chocolate cheesecake filling." 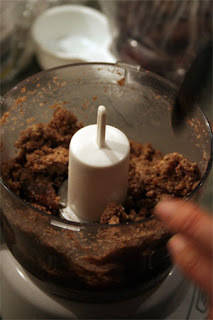 Blend everything together except for the cocoa powder and cherries until completely smooth. At this point, if your blender can take it, blend in the cocoa powder. Otherwise scrape the mixture into a mixing bowl and whisk the cocoa powder in by hand. Hand mix in the thawed cherries. If you want to make a sauce out of the cherries, either set some aside or use an additional package. *About the coffee extract. Coffee enhances the flavor of chocolate. I use Java Juice- Pure Organic Coffee Extract. The website is www.javajuiceextract.com. If you don’t want to use it, substitute more vanilla extract or just leave it out. Process the brazil nuts, shredded coconut, salt, cocoa powder and vanilla bean seeds in a food processor until fine crumbs. Add the agave and cacao nibs until the mixture just starts to stick together. Press into the bottom of a springform pan. If you are making a large cheesecake, feel free to double or even triple the recipe (crust and filling). Pour the filling over the crust and chill or freeze until ready to serve. Vanessa also posted a White Chocolate-Strawberry Cheesecake that's looks just fabulous. You can find the recipe here. It's your turn to see for yourselves what the fuss is all about. So which recipe is gonna be first? All these luscious cheesecakes. I liked Vanessa's black forest well enough, it's still in freezer, but her white chocolate strawberry cheesecake is my families favorite. 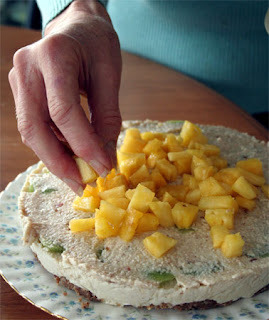 It's on the Gliving forum ~ a post about cheesecake recipe for those who asked I believe. Don't know why it's not on elsewhere there? Thanks for your feedbacks on Vanessa's cheesecakes. I'll try to locate her white choc. cheesecake and add the link to my post. I love your pages on cheesecake and chocolate. Do you have any suggestions for Christmas desserts, especially cookies? I am finding it hard to find something to serve my SAD parents and brother. I would recommend you drop by Raw Freedom Community's Holiday section for some great recipe ideas. ;-) There's also tons of other desserts that would be just perfect for Christmas in the Dessert section too. Carmella you truly are heaven sent. Your desserts are gorgeous and absolutely delectable. Thank you so much for the enthusiasm and joy you put into your recipes & thanks for sharing. I just have a doubt about the coconut oil/cacao butter..Coconut oil has a distinct taste that I do not much care for...what else can be substituted? How about a little gelatin? I have no idea what it is made of and if it fits the 'raw' category but it was just a thought!! How about using unscented coconut oil? It really doesn't yield any coconutty flavor to whatever you're making. I wouldn't recommend using gelatin as it is an animal product.